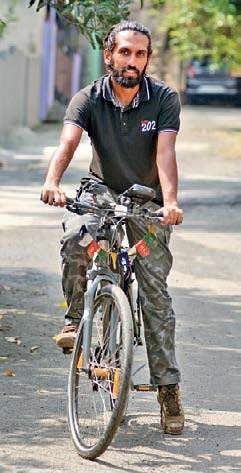 KOCHI: For Ankit Arora from Jaipur, cycling had never been more than just an activity until two and a half years back. An avid cycling enthusiast, the young lad is now attempting to enter the Guinness Book of World Records for covering ‘the longest journey by bicycle in a single country’. Having already covered 16 states and around 9,300 kilometres, Ankit is now in the capital city for a day, after which he will leave for Kanyakumari. “The previous record in this category was 15,222 kms, and I am aiming at completing 21,000 kms. I will be covering all states and union territories, except the Andaman and Nicobar islands and Lakshadweep,” says Ankit, who started from his hometown last August, covering much of Northern and Western India. For the travel lover, this is not the first attempt to make a record. The lad has earned a place in the India Book of Records the previous year for journeying 69 hours continuously on the famous Golden Triangle Route connecting Delhi, Agra and Jaipur. The youngster had pedalled continuously, stopping just for refreshments. Ankit feels that cycle is a medium which can help him connect to more people, apart from keeping one fit. Speaking more on how cycling has been beneficial, he says, “Besides being more challenging, I can use my cycle to reach villages, small towns and wherever I want. It also helps in staying fit. It liberates you from stress and hypertension, apart from helping in reducing the amount of pollution in cities.” It has been an experience of reaching out to more people and exploring places that led the travel writer to take a sabbatical and take up the long journey across the country. While he carried a heavy backpack with tents and sleeping bag while at Leh-Ladakh, the list of items he has brought along is meagre. “I left most of the items while coming back from the place, Now, I just carry with me a puncture kit, a couple of clothes and a GoPro camera,” states Ankit, who is also working on a travel documentary as well as another related to infrastructure and facilities of schools across the country.